Christmas and New Year’s Day are in our rear view mirrors now, and that means it’s time to think about the upcoming tax season. Of course, the deadline isn’t until April 17, 2018 but that doesn’t mean you should wait until April to get started. In fact, the first day the IRS will accept tax returns this year is January 21, 2018. Even if you aren’t ready quite that soon you can get started early and make tax time tolerable this year. Obviously it’s critical that you keep your records in good order to make tax time tolerable. If you have stacks of paperwork sitting around, sift through it. Eliminate the junk mail and file what needs to be kept. Group your receipts together as well as pay stubs, cancelled checks, and any other information that pertains to your income or expenses for 2017. You will need this information to complete your tax return soon. Will you be preparing your own tax return? If so, you need to know what you can and can’t deduct on your taxes. Missing deductions can make your tax liability higher so it’s important that you claim all that you can when they are applicable to you. If you are unsure, go to the IRS website or consult a tax professional. When you want to make tax time tolerable you should know some of the things you can do to avoid the hassles of an audit. The first is to keep accurate records and ensure your return is correct. Use a calculator and double check all math figures. This can not only prevent an audit but could help you avoid interest and penalties also. Another thing you can do to avoid an audit is to go over your deductions and make sure they are reasonable. For example, if you work from home but don’t have a lot of expenses don’t itemize things that could be questioned. What happens if you find an error on your return after you have sent it to the IRS? Clearly correcting it as soon as possible is the best thing you can do. You can file an amended return using the IRS Form 1040-X. If you owe any additional money, include your check so you are not penalized or charged for interest. There are very good reasons to file an electronic tax return. But there are arguments for filing by paper also. That’s why it’s a good idea to think before you rush to file one way or the other. One is so that you can expedite your refund if you are due one. Another reason to file electronically is if you don’t owe much, your return is simple, and you have the money to pay it now. Filing electronically has better odds that your return will have no errors. You can also avoid the postage a large return will require as well as the possibility of it getting lost through snail mail. However, if your return is complicated, filing by paper might be the better option. It can also help you financially to wait until closer to the deadline if you owe the IRS a lot of money. Waiting allows you more time to get your finances together. One way to make tax time tolerable is to file your taxes as soon as you can in the season. Not only will you get your refund earlier, if you are owed one, but you may prevent theft of your refund as well. Should a criminal target you and try to file a false return under your name they won’t be able to do so if you have already sent yours in and received your refund. Once you have your money in hand you will be able to put your tax refund to good use to help you financially. This is another great reason to finish your taxes earlier instead of later. In addition, the earlier you finish and file your taxes the faster you eliminate the stresses the tax season brings. Rather than worrying about it for a couple of months you get it over with. Although the deadline for filing taxes is quite a while off yet, you can begin preparing now. 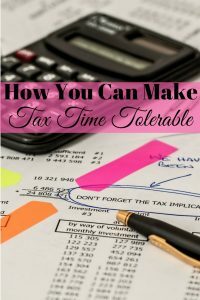 Once it gets closer you will have made tax time more tolerable for yourself if you do. What things do you do to make tax time tolerable for yourself?